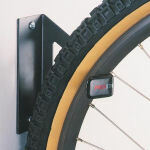 If you’re looking for simplicity when managing your bike storage needs, the epoxy coated, laser cut 12-gauge steel bike hanger is what you’re looking for. Installation is a cinch – there is no assembly required. Simply screw the hanger into the desired location and hang your bike from the tire. This hanger can be mounted either in the ceiling or on the wall, and the bike can hang either vertically or horizontally. See the diagram to the right for mounting options. For a vertical solution, you only need one hanger per bike. 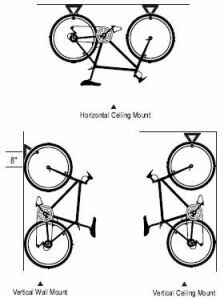 For a horizontal ceiling mount, you will need two hangers per bike. It’s not the most beautiful wall hook, but really, none of them are. It simply works great and isn’t too big. This product is easy to install and even easier to use. Simple, functional, practical. Best of its kind that I’ve seen.